In most facilities, space is a premium, and conveyor location is often dependent on machinery and facility design. At Dorner, our goal is to simplify your processes rather than impede them. We have several solutions designed to give you more floor space and easy access to machinery and other areas of your facility. 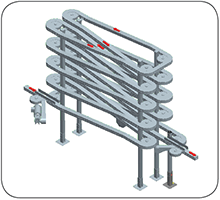 The Alpine Conveyor is a compact spiral configuration commonly used as an accumulation or elevating buffer zone between machines or as a process step for cooling or drying. It can also be used for line balancing or product changeover purposes. Alpines can be configured as an elevating/ lowering system with a single or double serpentine configuration. Uses include an in-line accumulator with entry and exit at different levels, or an in-line or off-line accumulator with entry and exit at the same level. Reduces the effects of machinery It will accumulate the products from one machine while the nest machine in the line is being repaired or adjusted. 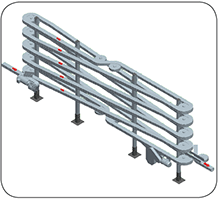 Products conveyed on Alpine Conveyors can be round, square, oval or even rectangular. If accumulation is required, attention does need to be paid to how the product accumulate in the corners. Round products obviously convey the best. Due to general long length of Alpines, they typically require the use of wheel bend corners. 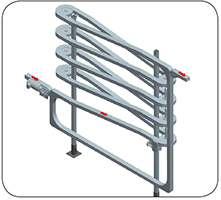 This limits available conveyor widths to 65, 85, 105 and 150 mm. Product width can be within the conveyor frame or slightly wider. Products wider than the conveyor should be limited to 40% of the conveyor width. 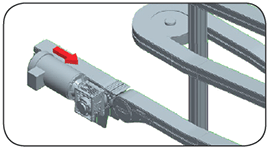 The direction of the chain, the length of the conveyor needed, and the elevation change will help determine the best choice for handling the chain. The two options are: to return the chain on the bottom of the conveyor, or use a top running chain that returns the chain to the infeed. Return Chain: Return chain Alpines have the chain running on the top side and return side, similar to a typical conveyor. This style is normally used for smaller Alpine units up to 4 layers and less than 23 meters (75 ft) long. 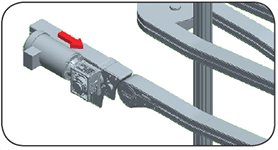 Top Running Chain: Top running chain runs on the top side of the conveyor only, and can be returned down the end of the Alpine, and back to the drive tail. This feature is used for larger Alpine units and is generally limited to a total of 76 meters (250 ft) of chain. If an Alpine is to be used as a buffer, it needs to be determined if in-line or off-line is desired. If in-line is used, all normal production flow goes through the Alpine and would be accumulated upon a storage signal. Typically, a stop device is required. Off-line has traffic flow around the Alpine and diverts into accumulation as needed. 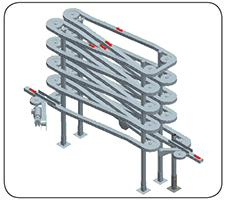 In this configuration the Alpine Conveyor is directly in-line with production equipment and product is required to flow through the Alpine section, keeping the product in the same order it is produced. For off-line configurations, the Alpine Conveyor is brought into sequence using a merge or divert mechanism as needed. Direction is determined by the product, belt selection, and product rate. Incline: Product being produced starts at a lower elevation and is moved to a higher elevation. Decline: Product being produced starts at a higher elevation and is moved to a lower elevation. Moving product from a machine or from an infeed section to the Alpine, or when transferring from the Alpine to a machine or discharge conveyors, requires investigation into the transfer and the product being transferred. Can the product bridge the gap between the conveyor tails? Will the product tip over when crossing gap? Will the product change orientation and is that critical? Will the product get bumped by other products? In cases where there are concerns with products getting across the gap or any of the previously mentioned considerations, Dorner offers various transfers to move products. Generally used for small products, less than 75 mm (3 in) in diameter. It is also required for off-line Alpines. A fixed plow guide transfers parts from one conveyor onto or off of the Alpine. Two tails coming together to form an X. A bend is installed so the two conveyors come closer together and the guiding transfers from one conveyor to the next in a straight line. Also used for parts smaller than 75 mm (3 in) in diameter and can only be used for in-line Alpine. Allows for product greater than 75 mm (3 in) in diameter. A small plate with rollers is attached to the conveyors allowing the product to roll over the gap. Depending on product size and speed a product may sit on the transfer plate requiring the next product to push it along. Roller transfer is used for one direction Alpines. Contains a slave driven power conveyor between the two conveyor tails. This transfer ensures the product transfers smoothly. Powered transfers are used for one direction Alpines and for product 75 mm (3 in) and greater. Alpine conveyors have similar constraints that straight conveyors with bends and corners do, the only difference is the Alpine does it all in the same footprint. Here are some areas to consider when designing an Alpine for an application. a certain amount of torque. The chain is designed to handle a certain amount of tension. The length of the conveyor will mean greater lengths of chain adding to the total weight. The product itself being conveyed and a pallet or puck if the product is being transported on one of these options. The weight of the product accumulated on the conveyor should not exceed 136 kgs (300lbs). The maximum recommended length of the Alpine Conveyor with a single gearmotor is 30 meters (98 ft). This may require catenary drive module or weighted take up for the chain. Additional sections of Alpine can be added directly above, but will require an additional gearmotor. 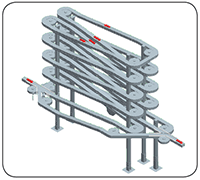 The overall length of the conveyor (footprint), the number of levels, the spacing between levels, and the chain path will determine the total length and the amount of levels that can be achieved. The product dimensions and shape are critical for making its way through the Alpine without getting jammed up. While round products can easily make their way through the sections, square or rectangle products need to have the proper guiding to insure the product flows correctly. guiding are not reviewed. The maximum speed should be kept less than 30 m/min (100 ft/min). All Alpines have an incline or decline. 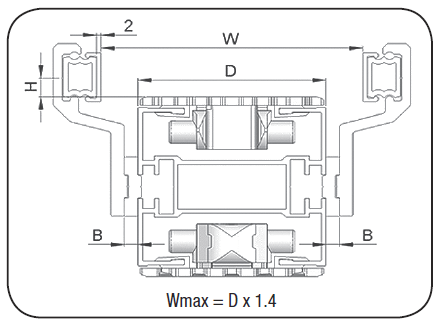 The maximum angle depends on the product and configuration. If the Alpine is a buffer with products accumulating back-to- back, the incline angle should not exceed 5 degrees. If the Alpine is used as transport, angles greater than 5 degrees can be used along with the friction insert chain. The environment the conveyors are placed in can impact the performance and life of the conveyor. Ambient temperatures, product temperature (hot or cold coming from another piece of equipment), debris, chemicals, humidity, water spray, ultraviolet light, and electronic static discharge are all things to consider and understand when selecting the components and the expected life of the conveyor. Dorner has over 50 years of experience designing conveyors for applications in a wide variety of environments using different loads and various speeds. While there are a number of areas to consider when designing an Alpine Conveyor, we are here to help with your application needs. Dorner offers three solutions for purchasing an Alpine Conveyor. The first solution is to order all the necessary parts and components to build your FlexMove Conveyor on This will require the proper tools for cutting, bending and installing the conveyor. 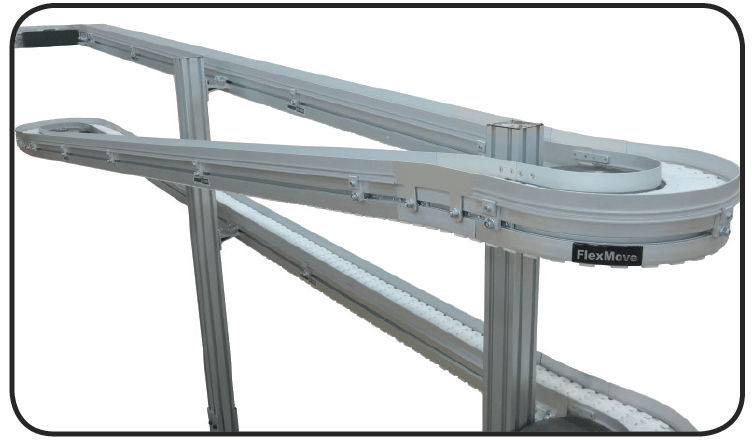 Consult our installation guide for FlexMove Conveyors for more details. 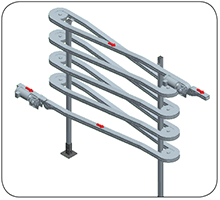 The second solution is to have a complete conveyor provided through our FlexMove With Flexmove Solutions you can have the conveyor built in our facility, tested, broken down into shippable sections and ship to the end site for installation. 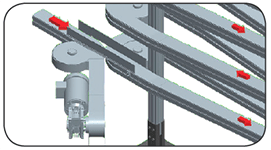 The third solution is to work with Dorner to have your FlexMove Conveyor assembled at the final The Conveyor will be purchased similar to option 1, but will be shipped as pre-cut and sized components. The Dorner installation team will then assemble and test the equipment at your location. Contact a Dorner representative for a quote on this service. Download the Alpine Specification Sheet.